The latest version of the Healthy Eating pyramid has been released. To be blunt- I am not that impressed. In the USA they have figured out that a plate has more meaning than a pyramid as one can more readily show proportions on a plate that people actually eat off. But no, we have to stick with the 1980’s approach. The original pyramid had three layers. This was tweaked slightly in the late 90’s and has not had any change in 15 years. Unless you look closely you won’t notice much difference. In fact the most notable change is to convert three layers into four – which if anything increases the confusion. To give credit where it is due there has been a slight reduction on the recommended amount of grains to eat and the grains layer has been separated out. Eating lots of plant-based foods (fruits and vegetables) is good advice. Yet the grains layer is still the second biggest and the graphic include biscuits and breakfast cereal! And, of course, fats and proteins are relegated to the eat little. This layer also includes nuts, eggs, fish, meat, poultry and dairy. Healthy fats, like olive oil and avocado are the tip of the pyramid. After 15 years Nutrition Australia has somehow missed a few things. Firstly, that saturated fats are not a problem in the diet. The USA no longer has cholesterol as a “nutrient of concern”. Hundreds of studies have failed to show any link between saturated fat consumption and any disease. Secondly, that the Mediterranean diet (which would fail the pyramid test) is the only type of diet which has been consistently shown to have a positive correlation with health outcomes. Those on this type of diet have lower rates of strokes and heart disease. Really? Where does this come from? Does everyone eat take away for one meal a day. I don’t think so. And what is their definition of “junk” anyway. The pyramid “… cuts through the misleading information and fad diets …” and “ … provides Australian with a credible, flexible and realistic guide to eating well”. Clearly they have not watched That Sugar Film, where Damon Gameau gains weight by eating “healthy low fat” food from the supermarket without once eating “junk”. Ultimately this new pyramid is an attempt to say we were right all along. It seeks to wag the finger at those who may be inclined to think for themselves. It is particularly aimed at the growing popularity of a Paleo type diet (for the record, I like the basics of Paleo but feel no diet should be that regimented as to totally exclude one food group). If there is any fad diet, it is the low fat diet, which in terms of human history is an aberration. There is no recognition that consumption of refined carbohydrates and low fat foods has been the major contributor to increased rates of obesity and type two diabetes. The new pyramid is essentially business as usual and lets ignore what does not suit our belief system. My view remains that healthy eating is simple. Eat manly foods, which in years gone by you could gather, or catch. Minimise intake of processed foods. Do not eat “low fat “foods. Drink mainly water. And it is better to eat off a plate than a pyramid. Hopefully by 2030, Nutrition Australia will have at least figured that much out. 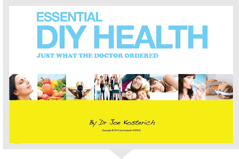 Dr Joe Kosterich M.B.B.S is an author, speaker, media presenter and health industry consultant, who wants you to be healthy and get the most out of life. He is a regular on TV – 9 Network Australia, and radio stations 6PR and 4BC as well as maintaining a website and this blog which provides health information. He is the health ambassador for locally grown fresh potatoes. Dr Joe also gives practical motivational health talks for the general public and organisations where he is known as “An independent doctor who talks about health”.